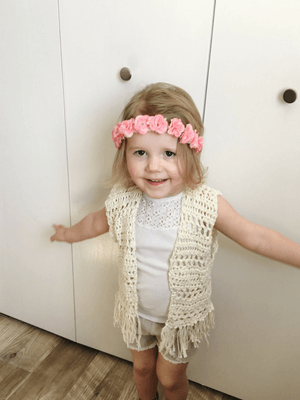 A toddler crochet vest pattern that is perfect for beginner crocheters, plus it has a boho fringe. How many times do you see a cute top and think “I could make that”? You shop for yarn only to realize it would have been cheaper to buy the top. I know the quality of handmade and the feeling of accomplishment doesn’t have a price, but it’s still a little disheartening. This all started by dreaming of the lake, warm sunshine, and a strawberry margarita. A swimsuit cover up was the plan. 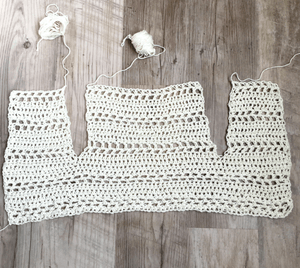 After crocheting a swatch, the stitch pattern was better suited for a vest. 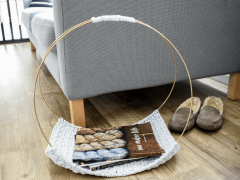 The airy boho feel is created by alternating half double crochets and chains. I love everything boho; crop tops, flower crowns, and anything with fringe. Seaming pieces together and sewing in ends is the worst part of crocheting. I wanted to make the boho vest all in 1 piece. The only seams to sew together are the shoulders. 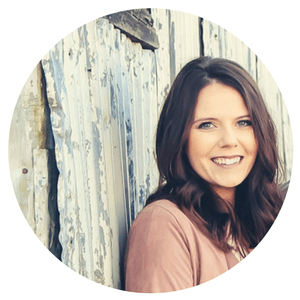 If you are a beginner to crochet, a vest is the perfect 1st garment to try. Clothing is intimidating. I waited years before I took the plunge. I didn’t want to waste all that time and yarn only to have a lopsided cardigan taking up space in my closet. So I made one for my daughter. 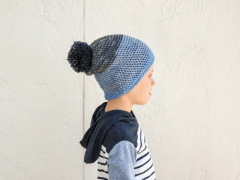 Here are a few more toddler crochet patterns. Surprisingly, it turned out. Don’t let fear hold you back. If little sister needs a matching boho chic vest you can get the Boho Baby Vest Pattern too. 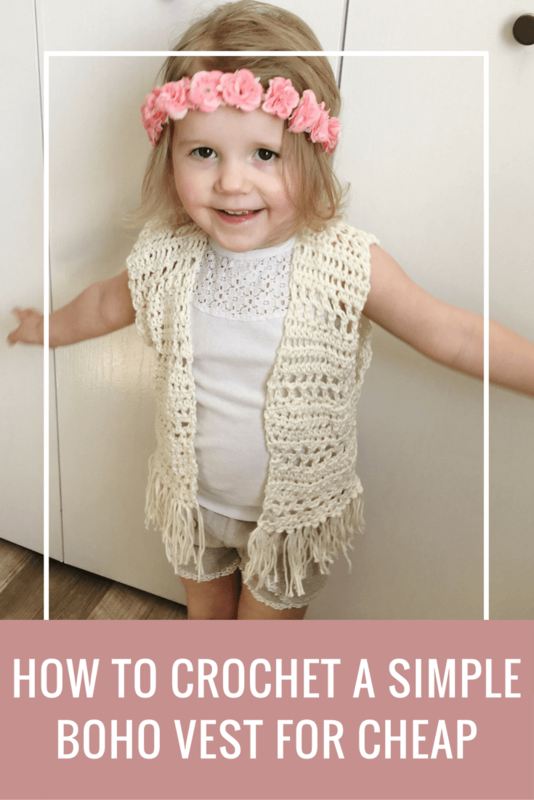 Ready to try your first crochet toddler sweater pattern? The Bell Crop Sweater explains every detail to make your first a success. If you can crochet a basic rectangle and sew the seams together you can make this vest. The toddler crochet vest pattern uses 1 skein of cotton yarn. You can get it on sale for $1.97. You’ll have enough cash left over for that strawberry margarita. I would love this pattern . I have a beautiful 4ply fine merino wool . Would this work? The 6.5 is referring to the mm measurement of the hook. The US hook size is K10.5/6.50mm. I hope this helps! Hi Tara! When you click the pink button above that says “Get the free PDF crochet pattern” you can enter your email and a link for the pattern will be sent to you. Check your spam folder, You’ll have to confirm the email address! I can’t wait to see your finished vest. I’m sure your girls will love it! I’m so happy to hear you love the pattern! The beginning chain of rounds 2 and 3 counts as 1 stitch. That might be where your counting is off. As long as you are ending with a hdc in the last stitch of row 2 and the turning ch of row 3 you’re vest should still be straight. I love this vest. Could you send me the pattern too. Thank you. I sent you an email Alyssa. Hello. This is a very nice vest. 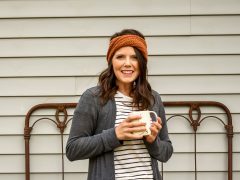 Can I have the pattern sent to my email ? Thanks. I would love to receive this pattern on my email. Can you please email directly to me as well? I have entered my email address but nothing is returned. I just sent you an email with a few more details. Could you make this pattern for adults to just make it bigger? Or have you tried it because i have been looking for one! I haven’t tried making this vest for adults. I don’t see why you couldn’t. It would be super cute! Hi, This is the coolest lil vest ever!!! I have entered my email address 3 or 4 times and I get the message that the pattern is on the way but I still haven’t received it. The first time I entered it was last night. Hi Cindy! I just sent you an email that should help. Enjoy the pattern! This is a test for me. Are final measurements available with the pattern? Yes, the measurements of the vest are included in the PDF pattern.